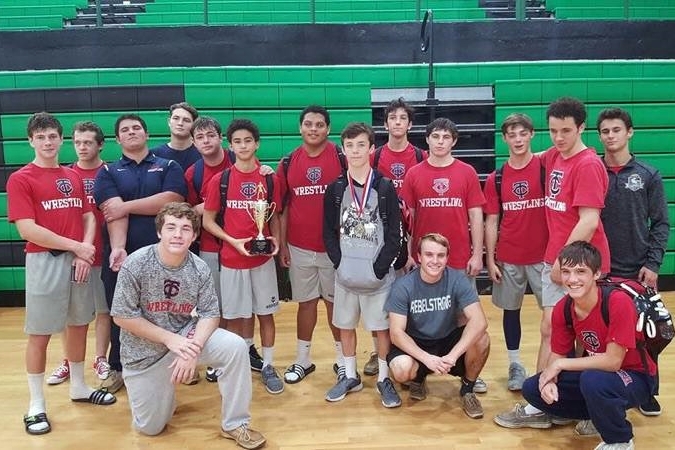 Teurlings Catholic won the Jacob McMillan Memorial tournament last Saturday, scoring 185 points, which was 24 points better than runner-up Rayne (185 points) and 26.5 points over crosstown rival Comeaux (148.5 points). 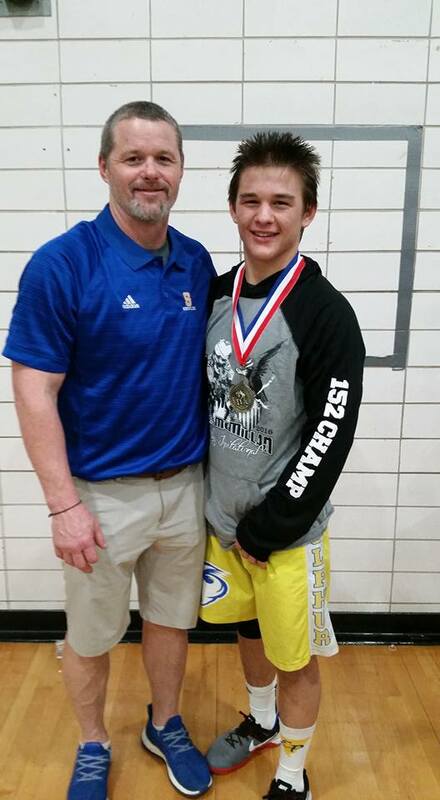 Colton Sonnier was the only champion for the Rebels, and three Rebels, Josh Hebert, George Femmer and Jacob LaFleur, placed second. 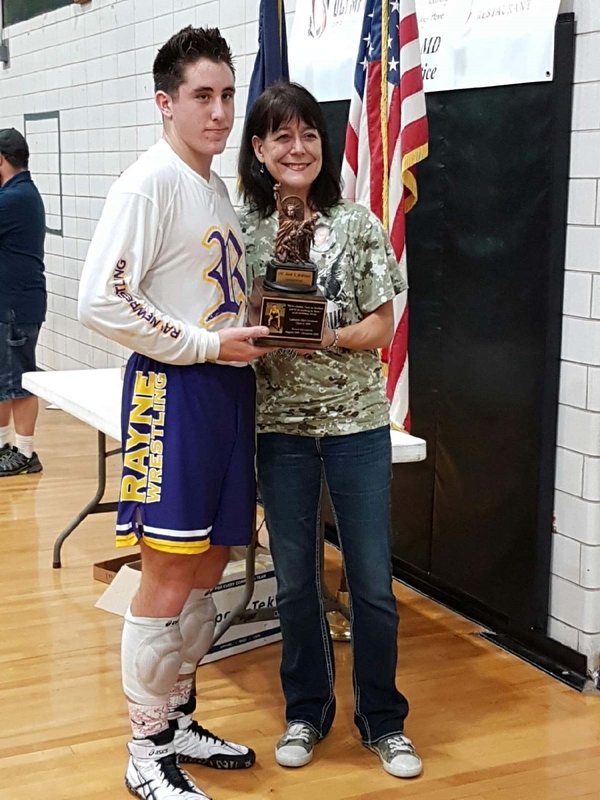 Gavin Christ of Basile Was awarded the Outstanding Wrestler award in the lower weight classes, and Tyler Carriere won the distinction for the heavier weight classes. 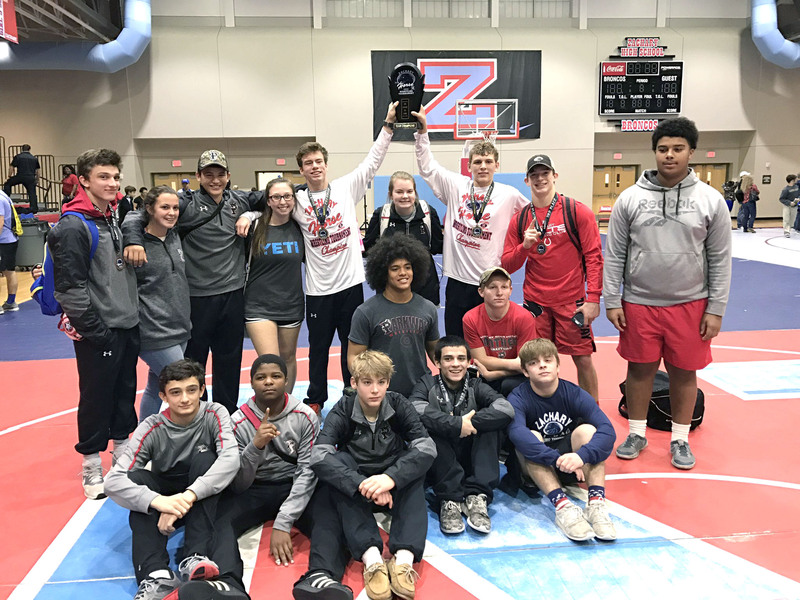 Parkway won the Zachary Big Horse by six points over Live Oak, 150 to 144. East Ascension placed third with 144 points. Denied a fourth consecutive Big Horse title, St. Amant placed fourth with 110 points. Ryan Huckaby and Dalton Driggers won individual championships for the Panthers. 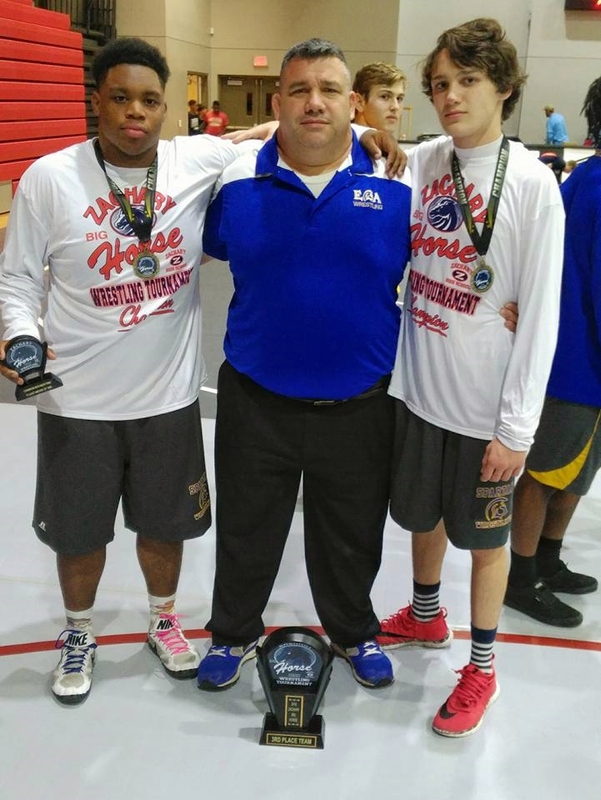 East Ascension champions Jordan Campbell and Trent Mahoney with the third-place team trophy (left) and Coach Pat Mahoney (right). At John Ehret High School last Saturday Grace King walked away with the Jefferson Parish Championships team title with 153 points, outdistancing runner-up Shaw 35.5 points. Winners for the Irish were Christian Ledet, Mauricio Ballesteros, Perry Hawxhurst, Dakota Stein and Glenwood Hunter. 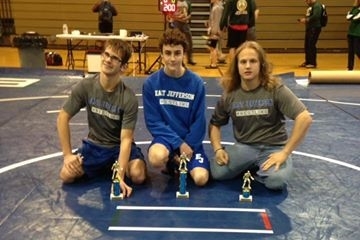 Left are East Jefferson's place-winners: James Montelaro placed first, Nicholas Shields placed second and Sean O'Flynn placed third for the Warriors. 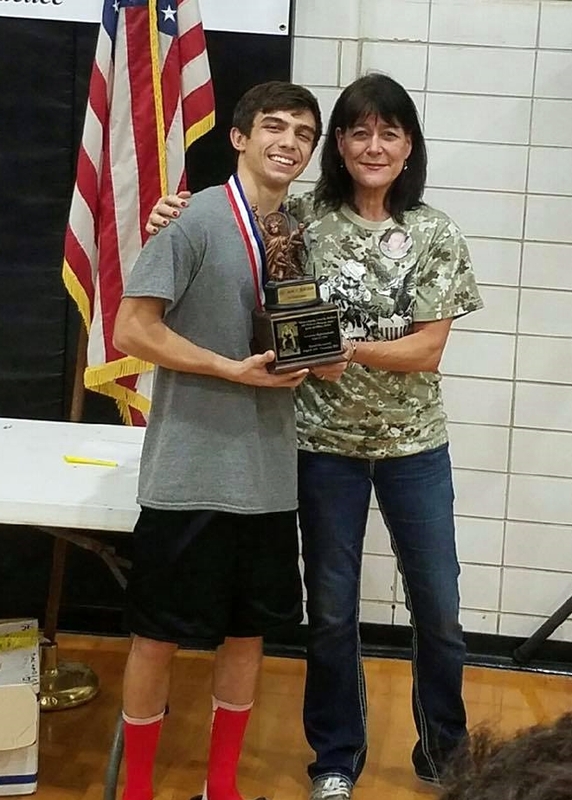 Joey Foret won his second consecutive Las Vegas Holiday Classic title last Saturday, and the Holy Cross Tigers placed fourth in the team standings. Jake Rando, who won this event in 2015, placed second after an 8-7 loss in the finals. Michael Lundin and Michael Benton placed sixth for the Tigers, and Randal Amos placed seventh. 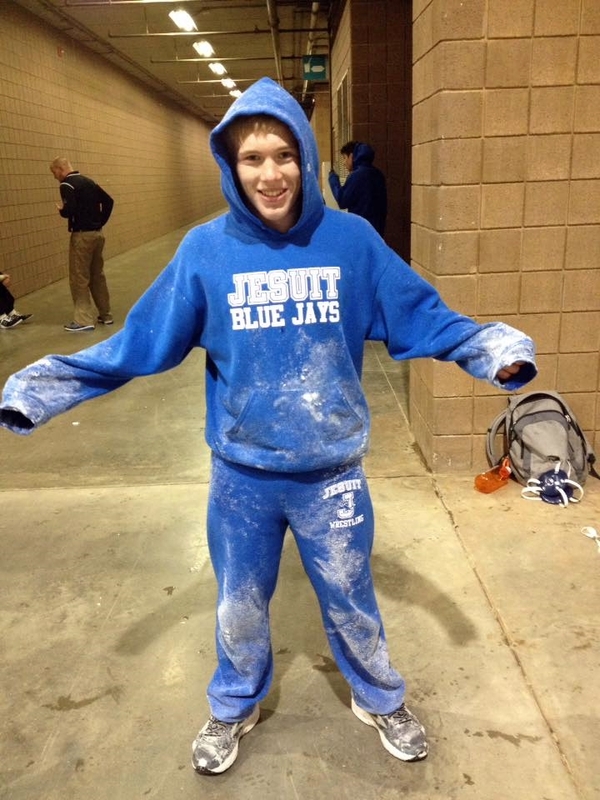 In near blizzard conditions outside, the Jesuit Blue Jays once again participated in the Kansas City Stampede. 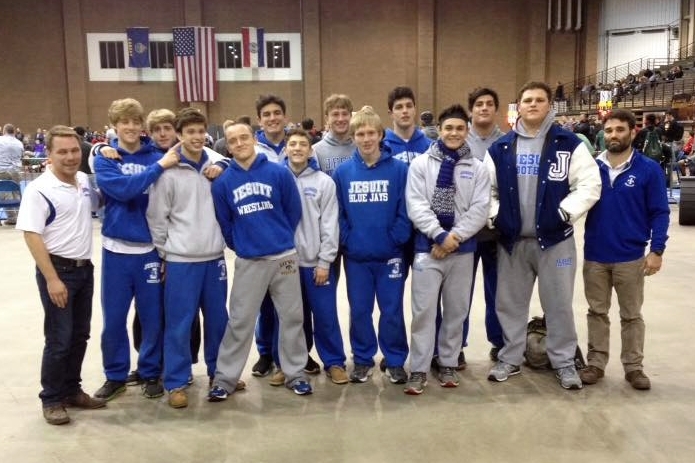 At left, the Jesuit squad in Missouri. At right, Brandon Greer covered in snow. 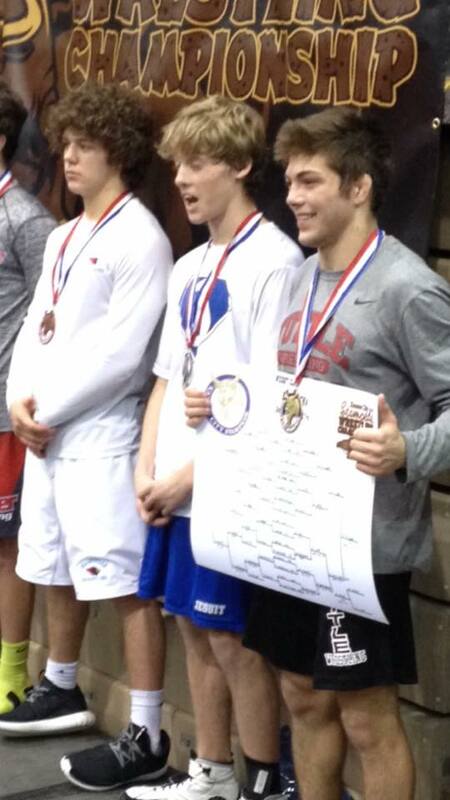 Returning Division I state champion Eli Larriviere placed second in the Gold Division at the Kansas City Stampede. 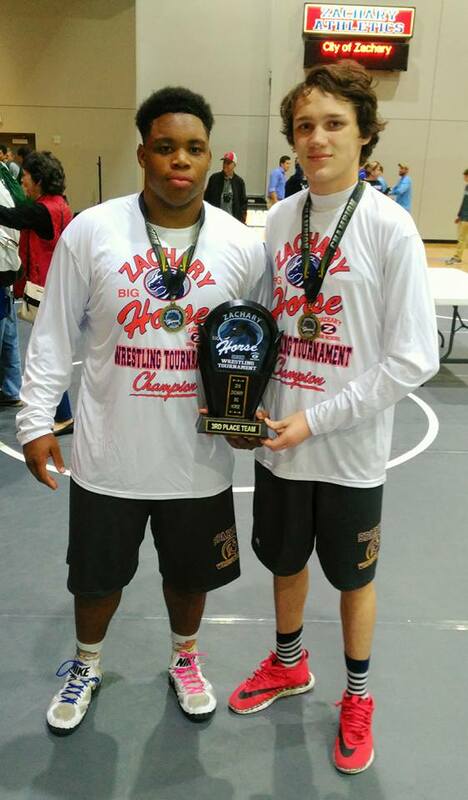 In his run to the finals Larriviere found himself pitted against Oklahoma's Stillwater High School's Kendon Lee, the former two-time Division III state champion and 2014 Louisiana Classic champion, among just a few of the titles he earned in his freshman and sophomore years at Brusly. 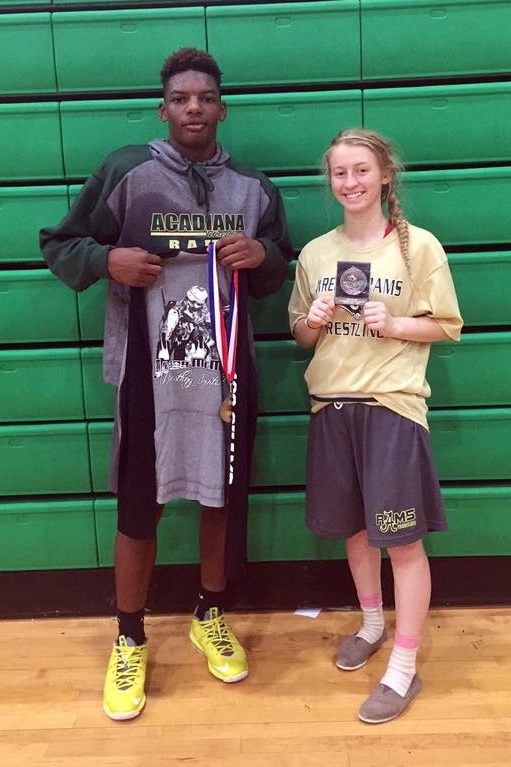 Larriviere won that match 5-3, and Lee ended up placing 4th. St. Paul's did better than the score indicates, winning four of the 11 matches contested. The Crusaders adjusted their early line-up to provide matches including Daniel Varnado vs. Brandon Stein at 113 lbs. and Luke Cotton against Cole Houser at 126 lbs. Varnado won his match 3-1, but was not "up a weight" against a returning Division I state champion, as Cotton was against Houser. Houser won that match 11-6. Cotton was able to move to 126 lbs. because three-time defending Crusader state champion Steven Shields was participating in Delaware's Beast of the East, at which he recorded a 4-2 record. The very anticipated match at 138 lbs. between Brother Martin's Patrick Evans and St. Paul's Shane Ulfers was cut short when Ulfers suffered an injury to the back of his head and was forced to withdraw early in the first period. That match-up could very likely occur Friday at the Trey Culotta, in which Evans and Ulfers are the number one and two seeds after Thursday's pool rounds.